Also you might be interested in these links (non-related to chess, but worth to check). Take your chess board, chess set and improve your skills! All this and other great chess stuff you can get absolutely free. The February issue of our free ChessZone Magazine has been released! Zurich Candidates, Moscow Open, the best games and tactics with annotations by our expert IM Anton Sitnikov. The January issue of our free ChessZone Magazine has been released! 12th Delhi Open, Wijk-an-Zee, Armenian championship, the best games and tactics with annotations by our expert IM Anton Sitnikov. The December issue of our free ChessZone Magazine has been released! World team championship, Kalkata Grand Master, the best games and tactics with annotations by our expert IM Anton Sitnikov. The November issue of our free ChessZone Magazine has been released! Chess World Championship Anand - Karlsen, European team championship, the best games and tactics with annotations by our expert IM Anton Sitnikov. The Octorber issue of our free ChessZone Magazine has been released! Chigorine Memorial, European team championship, the best games and tactics with annotations by our expert IM Anton Sitnikov. The September issue of our free ChessZone Magazine has been released! 88th Argentina championship, Trieste open the best games and tactics with annotations by our expert IM Anton Sitnikov. The Augest issue of our free ChessZone Magazine has been released! Open NK Dieren, Politiken Cup Helsingor, RTU Open, the best games and tactics with annotations by our expert IM Anton Sitnikov. The July issue of our free ChessZone Magazine has been released! Corporation "Centre" Cup, Sant Marti Barcelona Open, Czech Open, the best games and tactics with annotations by our expert IM Anton Sitnikov. Sberbank open, Ukraine championship, the best games and tactics with annotations by our expert IM Anton Sitnikov. The May issue of our free ChessZone Magazine has been released! European championship 2013, Ukraine Clubs Teams Championship, Chicago Open Wheeling, the best games and tactics with annotations by our expert IM Anton Sitnikov. The April issue of our free ChessZone Magazine has been released! 15th Dubai open, Open Golden Island Krk, Nakhchivan Open, the best games and tactics with annotations by our expert IM Anton Sitnikov. The March issue of our free ChessZone Magazine has been released! Daniel Noteboom memorial, Grenke chess classic, the best games and tactics with annotations by our expert IM Anton Sitnikov. 9th Panamerican Chess Championship, Moscow Open 2013, the best games and tactics with annotations by our expert IM Anton Sitnikov. World Chess Cities Championship, World Mind Games in Beijing, the best games and tactics with annotations by our expert IM Sitnikov Anton. 9th Vasilyshin Memorial, World Women Championship, the best games and tactics with annotations by our expert IM Sitnikov Anton. Detailed review of the best games of Chigorin Memorial in St. Petersburg with annotations by our expert IM Sitnikov Anton. The October issue of our free ChessZone Magazine has been released! Moroz Memorial, Ukraine championship 2012 (women), the best games and tactics with annotations by our expert IM Sitnikov Anton. Dortmund 2012, Tal Memorial, Voronezh open & Russian championship, the best games and tactics with annotations by our expert IM Iljin Timofey. Minsk open 2012, 87th France Championship, the best games and tactics with annotations by our expert IM Sitnikov Anton. Albena open 2012, 4th Grandmasters Tournament Lublin, the best games and tactics with annotations by our expert IM Sitnikov Anton. Russian Juniors Championship, Russian Team Championship, German Bundesliga, the best games and tactics with annotations by our expert IM Timofey Iljin. Moscow Open, Bundesliga 2012, European chess championship, the best games and tactics with annotations by our expert IM Timofey Iljin. Gibraltar open, Aeroflot open, the best games and tactics with annotations by our expert IM Timofey Iljin. Wijk-an-Zee, Gibraltar open, the best games and tactics with annotations by our expert IM Timofey Iljin. Chezh club chess championship, Danish chess championship, Regio-Emilia super-tournament, the best games and tactics with annotations by our experts (GM Valery Aveskulov, IM Anatoly Polivanov and IM Sergey Perun). Tal memorial, Spanish clubs championship, women chess championship, the best games and tactics with annotations by our experts (GM Valery Aveskulov, IM Anatoly Polivanov and IM Sergey Perun). Chigorin Memorial, Indonesia open chess championship, Unive Crown, the best games and tactics with annotations by our experts (GM Valery Aveskulov, IM Anatoly Polivanov and IM Sergey Perun). Livigno Open, European Clubs Chess Championship, Grand Slam Final (San-Paolo/Bilbao), the best games and tactics with annotations by our experts (GM Valery Aveskulov, IM Anatoly Polivanov and IM Sergey Perun). World chess cup, Russian Superfinal, the best games and tactics with annotations by our experts (GM Valery Aveskulov, IM Anatoly Polivanov and IM Sergey Perun). The August issue of our free ChessZone Magazine has been released! World team chess championship, Biel 2011 and Dortmund 2011 tournaments, the best games and tactics with annotations by our experts (GM Valery Aveskulov, IM Anatoly Polivanov and IM Sergey Perun). Bosnia & Herzegovina chess championship, 19th Sigeman & Co tournament, Morozevich is back! Also you can find there the best games and tactics with annotations by our experts (GM Valery Aveskulov, IM Anatoly Polivanov and IM Sergey Perun). Candidates matches, Capablanca memorial, Ukrainian chess championship semi-final, the best games and tactics with annotations by our experts (GM Valery Aveskulov, IM Anatoly Polivanov and IM Sergey Perun). Russian team championship, China and Hungary chess championships, the best games and tactics with annotations by our experts (GM Valery Aveskulov, IM Anatoly Polivanov and IM Sergey Perun). European chess championship, Amber tournament, the best games and tactics with annotations by our experts (GM Valery Aveskulov, IM Anatoly Polivanov and IM Sergey Perun). Aeroflot Open 2011, Romania and Sweden chess championships, the best games and tactics with annotations by our experts (GM Valery Aveskulov, IM Anatoly Polivanov and IM Sergey Perun). Nakamura's superresult in Wijk-an-Zee supertournament, other chess news, the best games and tactics with annotations by our experts (GM Valery Aveskulov, IM Anatoly Polivanov and IM Sergey Perun). London Chess Classics, Russian superfinal, Brazilian chess championship, other chess news, the best games and tactics with annotations by our experts (GM Valery Aveskulov, IM Anatoly Polivanov and IM Sergey Perun). Tal memorial, Russia chess cup final, other chess news, the best games and tactics with annotations by our experts (GM Valery Aveskulov, IM Anatoly Polivanov and IM Sergey Perun). European chess club championship, Nankin chess tournament, other chess news, the best games and tactics with annotations by our experts (GM Valery Aveskulov, IM Anatoly Polivanov and IM Sergey Perun). Spanish & chinese chess championships, Sabadell open, other chess news, the best games and tactics with annotations by our experts (GM Valery Aveskulov, IM Anatoly Polivanov and IM Sergey Perun). New FIDE rating list, Russian chess championship, Shanghai Masters, other chess news, the best games and tactics with annotations by our experts (GM Valery Aveskulov, IM Anatoly Polivanov and IM Sergey Perun). Biel Chess Festival, Sparkassen Chess-Meeting Dortmund 2010, 21st Chezh Open, other chess news, the best games and tactics with annotations by our experts (GM Valery Aveskulov, IM Anatoly Polivanov and IM Sergey Perun). New FIDE rating list, 4th Kings Tournament, Capablanca memorial, other chess news and the best games with annotations by our experts (GM Valery Aveskulov and IM Anatoly Polivanov). Israel team chess championship, Fide Grand Prix, other chess news and the best games with annotations by our experts (GM Valery Aveskulov and IM Anatoly Polivanov). Russian team chess championship, other chess news and the best games with annotations by our experts (GM Valery Aveskulov and IM Anatoly Polivanov). Amber chess tournament, European chess championship, other chess news and the best games with annotations by our experts (GM Valery Aveskulov and IM Anatoly Polivanov). Linares chess tournament, new FIDE Rating List, Moscow Open 2010 and Aeroflot, other chess news and the best games with annotations by our experts (GM Valery Aveskulov and IM Anatoly Polivanov). Corus Wijk-aan-Zee 2010, Gibraltar Gibtelecom Chess Festival, Moscow Open 2010, other chess news and the best games with annotations by our experts (GM Valery Aveskulov and IM Anatoly Polivanov). New section Free iPhone Chess Software has been added! Our new section Free iPhone Chess allows you to select and download a free iPhone chess application. At the moment we have one application in our collection but if you know something worth to be listed there, do not hesitate to email us! The January issue of our free ChessZone Magazine is out! World Chess Cup in Khanty-Mansiysk, 1st London Chess Classic, The Russian Championships, new FIDE rating list, other chess news and the best games with annotations by our experts (GM Valery Aveskulov and IM Anatoly Polivanov). We're also glad to introduce to you our new columnist IM Konstantin Tarlev and his column Chess School. Your feedback is highly appreciable. The December issue of our free ChessZone Magazine is out! World Youth Chess Championships, 17th European Team Chess Championship, UTD Invitational Chess Tournament in Dallas, other chess news and the best games with annotations by our experts (GM Valery Aveskulov and IM Anatoly Polivanov). The November issue of our free ChessZone Magazine is out! Tal Memorial 2009, 17th European Team Chess Championship, November FIDE Rating List, other chess news and the best games with annotations by our experts (GM Valery Aveskulov and IM Anatoly Polivanov). The October issue of our free ChessZone Magazine is out! Matches Kasparov - Karpov, Efimenko - Short, Inventi chess tournament in Antwerpen, other chess news and the best games with annotations by our experts (GM Valery Aveskulov and IM Anatoly Polivanov). The September issue of our free ChessZone Magazine is out! Grand Slam Masters Bilbao, 4th Kolkata Grandmaster Open, Yinzhou Cup World Women Teams, 10th Montreal International tournament, other chess news and the best games with annotations by our experts (GM Valery Aveskulov and IM Anatoly Polivanov). The Augest issue of our free ChessZone Magazine is out! Biel, Dortmund and Lake Sevan tournaments, other chess news and the best games with annotations by our experts (GM Valery Aveskulov and IM Anatoly Polivanov). The July issue of our free ChessZone Magazine is out! Poikovsky & Bazna tournaments, Capablanca memorial, other chess news and the best games with annotations by our experts (GM Valery Aveskulov and IM Anatoly Polivanov). Chess Library has been updated. The June issue of our free ChessZone Magazine is out! M-Tel Masters & Bosna tournaments, USA chess championship, other chess news and the best games with annotations by our experts (GM Valery Aveskulov and IM Anatoly Polivanov). The May issue of our free ChessZone Magazine is out! Gran Prix Fide, Russian Teams Chess Championship, other chess news and the best games with annotations by our experts (GM Valery Aveskulov and IM Anatoly Polivanov). The April issue of our free ChessZone Magazine is out! Linares 2009, Cappelle la Grande Open, other chess news and the best games with annotations by our experts (GM Valery Aveskulov and IM Anatoly Polivanov). The March issue of our free ChessZone Magazine is out! Topalov vs Kamsky match, Aeroflot 2009, German Championship, other chess news and the best games with annotations by our experts (GM Valery Aveskulov and IM Anatoly Polivanov). The February issue of our free ChessZone Magazine is out! Corus Wijk aan Zee 2009, FIDE Top 100 January 2009 Rating List, Reggio Emillia tournament, other chess news and the best games with annotations by our experts (GM Valery Aveskulov and IM Anatoly Polivanov). Elista Grand Prix, Pearl Spring Super GM Chess Tournament, Israeli Chess Championship, other chess news and the best games with annotations by our experts (GM Valery Aveskulov and IM Anatoly Polivanov). World Chess Olympiad in Dresden, other chess news and the best games with annotations by our experts (GM Valery Aveskulov and IM Anatoly Polivanov). World Chess Championship in Bonn, European Club Cup, Russian Chess Championship, The World Mindsports games in Beijing, other chess news and the best games with annotations by our experts (GM Valery Aveskulov and IM Anatoly Polivanov). New FIDE Rating List, SPICE Cup, 5th China vs Russia Chess Match, Women's World Championship, Grand Slam Final Bilbao, other chess news and the best games with annotations by our experts (GM Valery Aveskulov and IM Anatoly Polivanov). FIDE Grand Prixe in Sochi, Tal's and Rubinstein's Memorials, other chess news and the best games with annotations by our experts (GM Valery Aveskulov, IMs Rustam Khustnudinov and Anatoly Polivanov). Sparkassen Chess-Meeting, Poikovsky 2008, 41st Biel International Chess Festival, 36th World Open Philadelphia, other chess news and the best games with annotations by our experts (GM Valery Aveskulov, IMs Rustam Khustnudinov and Anatoly Polivanov). Aerosvit 2008, Karen Asrian sudden death & memorial tournament, FIDE July rating list, other chess news and the best games with annotations by our experts (IMs Rustam Khustnudinov and Anatoly Polivanov). 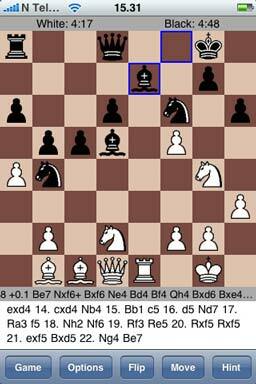 New section Mobile Chess Software have been added! Our new section Mobile Chess Software is for true mobile chess users who can't live without chess at all. Here you could download chess for cell phone and don't be upset if your phone beats you one day! Fide GP in Baku, M-Tel Masters, Moscow Chess Championsip 2008, Capablanca Memorial in La Habana, Lion & Navara - Kramnik chess match highlights, other chess news and the best games with annotations by our experts (IMs Rustam Khustnudinov and Anatoly Polivanov). First FIDE Grand Prix in Baku, European Chess Championship 2008, Dos Hermanas Rapid, 16th Sigeman and Co Chess Tournament, Dutch Championship, Gausdal Classic 2008, Russian Team Championship 2008 highlights, other chess news and the best games with annotations by our experts (IMs Rustam Khustnudinov and Anatoly Polivanov). Morelia-Linares, Amber Blindfold & Rapid, Serbian Chess Championship, Ataturk International Women Masters and 65th Polish Championship highlights, other chess news and the best games with annotations by our experts (IMs Rustam Khustnudinov and Anatoly Polivanov). All games played by classic world chess champion (2000-2007) Vladimir Kramnik added. There is also Kramnik's chess dossier available in zipped CBV database. Enjoy! Enjoy the classic chess ebook "The Art of the Middle Game" by Paul Keres and Alexander Kotov. Another one great chess book "Judgment And Planning In Chess" by former Chess World Champion Max Euwe added. The classic chess book "The Ideas Behind The Chess Openings" by Reuben Fine added. It has been said that ideas are weapons. That is certainly as true in chess as in any fields. A mastery of a little theory which conveys real understanding of the game is infinitely more valuable than a carefully memorized compilation of endless moves.